NASA's future plans to explore Mars may end up using astronauts as space messengers. 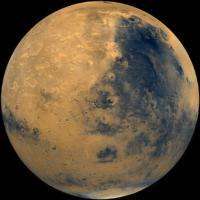 The new idea surfaced as a special team looking for a new Mars robotic exploration plan released a preliminary report Tuesday. One of the option calls for a Martian robotic rover to collect rocks on the red planet. Later, astronauts in a newly built spaceship would be used to pick them up from a cosmic delivery point somewhere between Earth and Mars and return them home. The report gives the space agency several options with no specific timing for future missions and no decision is expected until next year. The new plan is needed because budget cuts earlier this year killed two future robotic flights. The space agency has so far explored Mars with orbiters and robots, like the rover Curiosity that landed last month. The ultimate goal has been to get a robot to collect rocks and Martian soil to send to Earth for more detailed scientific examination. Separately, NASA is working on new missions for astronauts to explore away from Earth, with an ultimate goal of sending them to Mars sometime in the 2030s. The NASA team proposed combining both dreams, getting astronauts involved in Martian exploration earlier. But they wouldn't exactly go to Mars itself. The astronauts would go somewhere between Mars and Earth and pick up the rocks left by a spacecraft that carried them off Mars. That plan takes advantage of the new rocket and spaceship system for astronauts that should be ready in the next decade, said NASA associate administrator for sciences John Grunsfeld. It also would lessen contamination worries about the Martian rocks. Scientists want to make sure that the Martian samples could not bring alien germs to Earth and that Earth organisms don't contaminate the Martian sample, Grunsfeld said. And it would help the mission to land humans on Mars because it "looks a lot like sending a crew to Mars and returning them safely," Grunsfeld said. —Send a bunch of spacecraft to Mars—a rover, a launcher to return home, an orbiter—in several launches. —Package all those spacecraft into one or two launches that would save money but increase risk of failure. —Send a bunch of small rovers to look around different spots of Mars to find the best samples and then design a system to collect and return those rocks. Before that can happen, NASA still has to decide what robotic or orbiter mission it wants to send to Mars in 2018, if any. It's a time when Earth and the red planet will be close and save money on fuel costs. Grunsfeld said NASA only has about $800 million budgeted for that, which is not enough for a major rover. I favor a combination of the first and third options: Send several identical missions, each with a bunch of small rovers, launcher, and orbiter. Also send drills, excavators, mining and refining equipment, robotic construction workers, and some small nuclear power plants to power it all and generate fuel for future missions. If there's not enough money for all of this, cut the war and conquest budget by 5% for just one year. I am also a proponent of directly setting up a base on Mars: if setting a permanent base on Mars is done as of the first Mars mission, tremendous amount of research can be conducted and especially, it would avoid humanity to repeat its Moon mishap: going there just a couple of times to prove the technology reliable, and leave permanently. This hybrid manned/robotic mission would be cheaper? Or more efficient? Or just less likely to be cut from a future budget? This high cost mission suggestion is the result of having SLS forced on NASA while not having enough money for robotic science missions as well. The result will be minimal and delayed science. The long term affects of cosmic radiation, zero gravity, confinement etc are currently both crippling and irreversible ( or worse) on humans.. Yes, it's a budgeting trick. There's only 800 mill in the budget for mars exploration, but there's a bunch of money budgeted for some non-specific human mission beyond the moon. By combining the two, they can play the shell game with the money, and move some money magically from the human bedget to the mars sample return mission budget. It's kinda a way to do what the whitehouse said they want, while still doing the sample return we really need before we can send people to Mars. You know, if we're going to do a sample return, it would be cool to get a piece of Phobos too. It would also be pragmatic to place another communications relay orbiter at Mars.